Microorganisms buried in marine sediments are known to endure starvation over geologic timescales. However, the mechanisms of how these microorganisms cope with prolonged energy limitation is unknown and therefore yet to be captured in a quantitative framework. Here, we present a novel mathematical model that considers (a) the physiological transitions between the active and dormant states of microorganisms, (b) the varying requirement for maintenance power between these phases, and (c) flexibility in the provenance (i.e., source) of energy from exogenous and endogenous catabolism. The model is applied to sediments underlying the oligotrophic South Pacific Gyre where microorganisms endure ultra‐low fluxes of energy for tens of millions of years. Good fits between model simulations and measurements of cellular carbon and organic carbon concentrations are obtained and are interpreted as follows: (a) the unfavourable microbial habitat in South Pacific Gyre sediments triggers rapid mortality and a transition to dormancy; (b) there is minimal biomass growth, and organic carbon consumption is dominated by catabolism to support maintenance activities rather than new biomass synthesis; (c) the amount of organic carbon that microorganisms consume for maintenance activities is equivalent to approximately 2% of their carbon biomass per year; and (d) microorganisms must rely solely on exogenous rather than endogenous catabolism to persist in South Pacific Gyre sediments over long timescales. This leads us to the conclusion that under oligotrophic conditions, the fitness of an organism is determined by its ability to simply stay alive, rather than to grow. This modelling framework is designed to be flexible for application to other sites and habitats, and thus serves as a new quantitative tool for determining the habitability of and an ultimate limit for life in any environment. Cool hydrothermal systems (CHSs) are prevalent across the seafloor and discharge fluid volumes that rival oceanic input from rivers, yet the microbial ecology of these systems are poorly constrained. The Dorado Outcrop on the ridge flank of the Cocos Plate in the northeastern tropical Pacific Ocean is the first confirmed CHS, discharging minimally altered <15∘C fluid from the shallow lithosphere through diffuse venting and seepage. In this paper, we characterize the resident sediment microbial communities influenced by cool hydrothermal advection, which is evident from nitrate and oxygen concentrations. 16S rRNA gene sequencing revealed that Thaumarchaea, Proteobacteria, and Planctomycetes were the most abundant phyla in all sediments across the system regardless of influence from seepage. Members of the Thaumarchaeota (Marine Group I), Alphaproteobacteria (Rhodospirillales), Nitrospirae, Nitrospina, Acidobacteria, and Gemmatimonadetes were enriched in the sediments influenced by CHS advection. Of the various geochemical parameters investigated, nitrate concentrations correlated best with microbial community structure, indicating structuring based on seepage of nitrate-rich fluids. A comparison of microbial communities from hydrothermal sediments, seafloor basalts, and local seawater at Dorado Outcrop showed differences that highlight the distinct niche space in CHS. Sediment microbial communities from Dorado Outcrop differ from those at previously characterized, warmer CHS sediment, but are similar to deep-sea sediment habitats with surficial ferromanganese nodules, such as the Clarion Clipperton Zone. We conclude that cool hydrothermal venting at seafloor outcrops can alter the local sedimentary oxidation–reduction pathways, which in turn influences the microbial communities within the fluid discharge affected sediment. Geothermobacter sp. strain HR-1 was isolated from the Lō‘ihi Seamount vent system in the Pacific Ocean at a depth of 1,000 m. Reported here is its 3.84-Mb genome sequence. This research was funded as part of the 2017 NSF Community College Cultivation Cohort (C4) Research Experience for Undergraduates. As we train the next generation of Science, Technology, Engineering, and Math (STEM) researchers, it is imperative that we expand our recruitment to community college students. Many of these students are highly motivated and extremely talented, but they often lack exposure to cutting edge technology found at R1 institutions, much less have the opportunities to participate in original research. 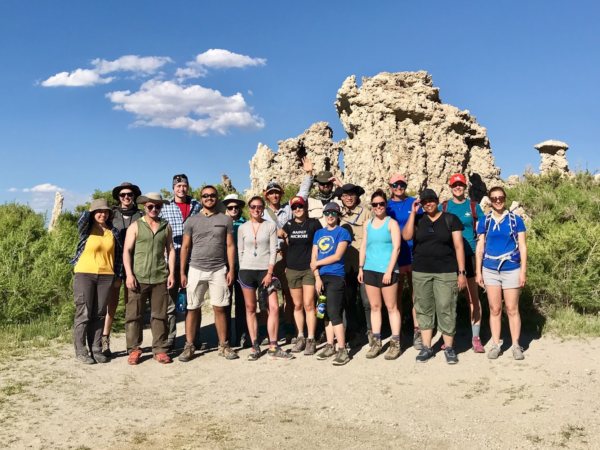 The Center for Dark Energy Biosphere Investigations (C-DEBI) at the University of Southern California (USC) started a community college research internship summer program in 2013. The non-residential and residential programs combined so far have trained 60 students in the biogeosciences, with 46 of them having transferred to four-year institutions and 95% remaining in STEM fields. Their introduction to and acquired competence in several advanced technologies have further prepared these students to pursue graduate degrees and rewarding careers in research-based STEM fields. The Marine Technology Society is a not-for-profit, international, professional association. Founded in 1963, the Society believes that the advancement of marine technology and the productive, sustainable use of the oceans depend upon the active exchange of ideas between government, industry and academia. See www.mtsociety.org. Ⓒ 2018 Marine Technology Society. This article is for personal use only, and is not to be distributed in any format. Microbial ecology within oligotrophic marine sediment is poorly understood, yet is critical for understanding geochemical cycles. Here, 16S rRNA sequences from RNA and DNA inform the structure of active and total microbial communities in oligotrophic sediment on the western flank of the Mid-Atlantic Ridge. Sequences identified as Bacillariophyta chloroplast were detected within DNA, but undetectable within RNA, suggesting preservation in 5.6-million-year-old sediment. Statistical analysis revealed that RNA-based microbial populations correlated significantly with nitrogen concentrations, whereas DNA-based populations did not correspond to measured geochemical analytes. Bioenergetic calculations determined which metabolisms could yield energy in situ, and found that denitrification, nitrification, and nitrogen fixation were all favorable. A metagenome was produced from one sample, and included genes mediating nitrogen redox processes. Nitrogen respiration by active bacteria is an important metabolic strategy in North Pond sediments, and could be widespread in the oligotrophic sedimentary biosphere. Calorimetric measurements of the change in heat due to microbial metabolic activity convey information about the kinetics, as well as the thermodynamics, of all chemical reactions taking place in a cell. Calorimetric measurements of heat production made on bacterial cultures have recorded the energy yields of all co-occurring microbial metabolic reactions, but this is a complex, composite signal that is difficult to interpret. Here we show that nanocalorimetry can be used in combination with enumeration of viable cell counts, oxygen consumption rates, cellular protein content, and thermodynamic calculations to assess catabolic rates of an isolate of Shewanella oneidensis MR-1 and infer what fraction of the chemical energy is assimilated by the culture into biomass and what fraction is dissipated in the form of heat under different limiting conditions. In particular, our results demonstrate that catabolic rates are not necessarily coupled to rates of cell division, but rather, to physiological rearrangements of S. oneidensis MR-1 upon growth phase transitions. In addition, we conclude that the heat released by growing microorganisms can be measured in order to understand the physiochemical nature of the energy transformation and dissipation associated with microbial metabolic activity in conditions approaching those found in natural systems. Hydrogenovibrio sp. strain SC-1 was isolated from pyrrhotite incubated in situ in the marine surface sediment of Catalina Island, CA. Strain SC-1 has demonstrated autotrophic growth through the oxidation of thiosulfate and iron. Here, we present the 2.45-Mb genome sequence of SC-1, which contains 2,262 protein-coding genes. The in situ production of necromass and its role as a power source in sustaining heterotrophic microorganisms in natural settings has never been quantified. Here, we quantify the power availability from necromass oxidation to living microorganisms buried in marine sediments over millions of years, first in the oligotrophic South Pacific Gyre (SPG), and second on a global scale. We calculate that power from autochthonously produced necromass in the upper meter of sediment at SPG provides only a small fraction (~0.02%) of the maintenance power demand of the living community (1.9×10-19 W cell-1). Power from necromass oxidation diminishes considerably with increasing sediment depth (and thus sediment age). Alternatively, the oxidation of allochthonous organic matter, and of radiolytic H2, provides power equivalent to or in excess of the maintenance demands of living microorganisms at SPG. On a global scale, necromass may support the maintenance power demand of 2 to 13% of the microbial community in relatively young sediments (<10,000 years) when it is oxidized with SO42- and O2 respectively. However, in older sediments, the power supplied by necromass is negligible (<0.01%). Nevertheless, the oxidation of a single dead cell per year provides sufficient power to support the maintenance demands of dozens to thousands of cells in low-energy marine sediments. This raises the possibility that the production and oxidation of necromass may provide a mechanism for non-growing microorganisms to endure unfavorable, low-energy settings over geological timescales. Marine sediments constitute one of the most energy-limited habitats on Earth, in which microorganisms persist over extraordinarily long timescales with very slow metabolisms. This habitat provides an ideal environment in which to study the energetic limits of life. However, the bioenergetic factors that can determine whether microorganisms will grow, lie dormant, or die, as well as the selective environmental pressures that determine energetic trade-offs between growth and maintenance activities, are not well understood. Numerical models will be pivotal in addressing these knowledge gaps. However, models rarely account for the variable physiological states of microorganisms and their demand for energy. Here, we review established modeling constructs for microbial growth rate, yield, maintenance, and physiological state, and then provide a new model that incorporates all of these factors. We discuss this new model in context with its future application to the marine subsurface. Understanding the factors that regulate cell death, physiological state changes, and the provenance of maintenance energy (i.e., endogenous versus exogenous metabolism), is crucial to the design of this model. Further, measurements of growth rate, growth yield, and basal metabolic activity will enable bioenergetic parameters to be better constrained. Last, biomass and biogeochemical rate measurements will enable model simulations to be validated. The insight provided from the development and application of new microbial modeling tools for marine sediments will undoubtedly advance the understanding of the minimum power required to support life, and the ecophysiological strategies that organisms utilize to cope under extreme energy limitation for extended periods of time. Geothermobacter sp. strain EPR-M was isolated from a hydrothermal vent on the East Pacific Rise and has been shown to participate in the reduction of Fe(III) oxides. Here, we report its 3.73-Mb draft genome sequence. Life may have emerged on early Earth in serpentinizing systems, where ultramafic rocks react with aqueous solutions to generate high levels of dissolved H2 and CH4 and, on meeting seawater, steep redox, ionic, and pH gradients. Most extant life harnesses energy as ion (e.g., H+, Na+) gradients across membranes, and it seems reasonable to suggest that environments with steep ion gradients would have also been important for early life forms. The Strytan Hydrothermal Field (SHF) is a mid-ocean ridge–flank submarine hydrothermal (~70 °C) vent in Iceland that produces steep Na+ (<3–468 mM) and pH (8.1–10.2) gradients, concomitant with enrichments in methane (0.5–1.4 μM) and hydrogen (0.1–5.2 μM), relative to seawater. Large (up to 55 m) saponite towers create ideal "incubators" similar to other proposed origin-of-life analogs (e.g., Lost City hydrothermal field in the mid-Atlantic). However, the SHF is basalt hosted. We suggest that the observed conditions are generated by (1) plagioclase hydrolysis, coupled with calcite precipitation, and (2) hydration of Mg in pyroxene and olivine in basalt. Along with microbial activity, aqueous reactions of Fe in olivine and pyroxene are possible sources of the observed H2. Although the δ13C-CH4 values were highly variable (–53‰ to –8‰), isotopically heavy CH4 suggests possible abiotic formation or the imprint of methane oxidation. If environments similar to SHF occurred on the early Earth, they should be considered as potential origin-of-life environments. Microbial life in the deep subsurface biosphere is taxonomically and metabolically diverse, but it is vigorously debated whether the resident organisms are thriving (metabolizing, maintaining cellular integrity, and expressing division genes) or just surviving. As part of Integrated Ocean Drilling Program (IODP) Expedition 347: Baltic Sea Paleoenvironment, we extracted and sequenced RNA from organic carbon-rich, nutrient-replete, and permanently anoxic sediment. In stark contrast to the oligotrophic subsurface biosphere, Baltic Sea Basin samples provided a unique opportunity to understand the balance between metabolism and other cellular processes. Targeted sequencing of 16S rRNA transcripts showed Atribacteria (an uncultured phylum) and Chloroflexi to be among the dominant and the active members of the community. Metatranscriptomic analysis identified methane cycling, sulfur cycling, and halogenated compound utilization as active in situ respiratory metabolisms. Genes for cellular maintenance, cellular division, motility, and antimicrobial production were also transcribed. This indicates that microbial life in deep subsurface Baltic Sea Basin sediments was not only alive, but thriving. We have analyzed the dissolved organic carbon, OC, in ocean basement fluids using Fourier Transform-Ion Cyclotron Resonance-Mass Spectrometry (FT-ICR-MS). The compounds identified at the two sites, near the Juan de Fuca and Mid-Atlantic Ridges (North Pond), differ substantially from each other and from seawater. Compared to Juan de Fuca, North Pond organics had a lower average molecular weight (349 vs. 372 g/mol), 50% more identifiable compounds (2181 vs. 1482), and demonstrably lower average nominal oxidation state of carbon (-0.70 vs. -0.57). The North Pond fluids were also found to have many more N- and S-bearing compounds. Based on our data, the marine subsurface can alter the types of dissolved OC, DOC, compounds in seawater. Samples were collected from 3 sites: Big Strytan, Arnarnasstrytan, and Hrisey (see lat/lon below). SCUBA diving was utilized to collect vent fluids and hydrothermal precipitates. Vent fluids for geochemistry were sampled in sterile 60 ml syringes. The first 20 ml was discarded to decrease the amount of seawater contamination during sampling. Vent fluid sampling for dissolved gases consisted of 2 methods: 1) the “syringe-to- syringe” method (STS), and 2) the “syringe-to-bottle” method (STB). The STS method consisted of pulling 40 ml of vent fluid at the end of a dive, transporting it back to the lab, and equilibrating the fluid with 20 ml of purified N2. The gas was then injected into Cali-5-Bond gas sampling bags for transport prior to analysis by GC. The STB method consisted of pulling a known volume of vent fluid (typically 40 ml) into a syringe, and immediately injecting into a 60 ml N2-flushed, evacuated, serum bottle. General term for an instrument that measures the temperature of the water with which it is in contact (thermometer). pH/ORP/Conductivity/TDS were measured on shore using a Myron-L field pH meter. Samples were collected from 3 sites: Big Strytan, Arnarnasstrytan, and Hrisey (see lat/lon below). SCUBA diving was utilized to collect vent fluids and hydrothermal precipitates. Vent fluids for geochemistry were sampled in sterile 60 ml syringes. The first 20 ml was discarded to decrease the amount of seawater contamination during sampling. Vent fluid sampling for dissolved gases consisted of 2 methods: 1) the “syringe-to- syringe” method (STS), and 2) the “syringe-to-bottle” method (STB). The STS method consisted of pulling 40 ml of vent fluid at the end of a dive, transporting it back to the lab, and equilibrating the fluid with 20 ml of purified N2. The gas was then injected into Cali-5-Bond gas sampling bags for transport prior to analysis by GC. The STB method consisted of pulling a known volume of vent fluid (typically 40 ml) into a syringe, and immediately injecting into a 60 ml N2-flushed, evacuated, serum bottle. DIC was analyzed at NASA Ames in the lab of Tori Hoehler. Temperatures were measured in situ using a temperature probe. The pH/ORP/Conductivity/TDS were measured on shore using a Myron-L field pH meter. Aliquots for H2S measurements were preserved in the field by precipitation of ZnS following the addition of 1 ml of a 50 mM zinc acetate solution to a 3 ml sample, placed on dry ice, and analyzed in the laboratory with a spectrophotometer at a wavelength of 670 nm. Samples for anion analysis (Br, Cl, and SO4) were filtered in the field (0.2 um), placed on dry ice, and kept frozen until measurement in the laboratory using ion chromatography. Samples for analysis of major cations and trace elements (Na, B, Mg, Si, K, Ca, Al, As, V, Cr, Cu, Zn, Sr, Mo, and W) were preserved in the field by filtering (0.2 um) and acidification with 0.1% ultrapure HNO3, and measured by inductively coupled plasma-mass spectrometry (ICP-MS). 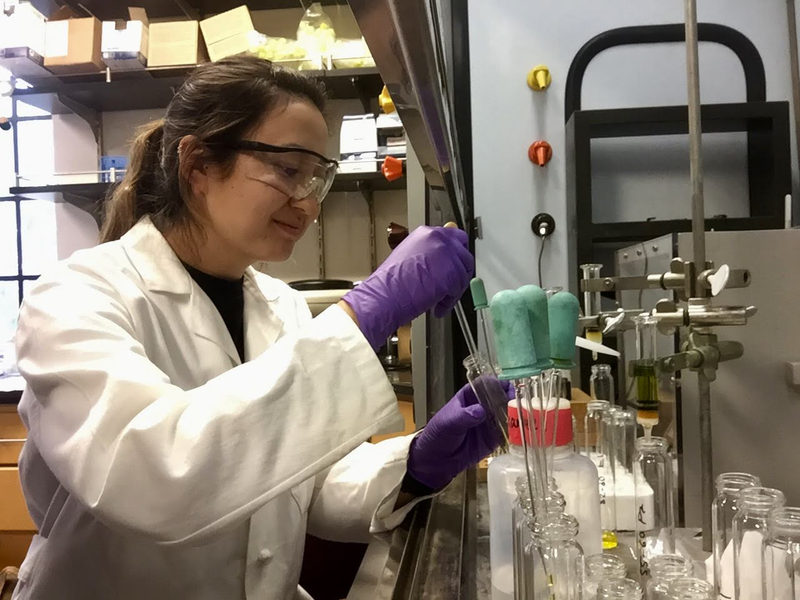 Dissolved gases (H2, CH4, and CO), as well as organic acids and DIC, were analyzed at NASA Ames in the lab of Tori Hoehler. D13C-CH4 was measured at Montana State University by Eric Boyd. Temperatures were measured in situ using a temperature probe. The pH/ORP/Conductivity/TDS were measured on shore using a Myron-L field pH meter. Samples for analysis of major cations and trace elements (Na, B, Mg, Si, K, Ca, Al, As, V, Cr, Cu, Zn, Sr, Mo, and W) were preserved in the field by filtering (0.2 um) and acidification with 0.1% ultrapure HNO3, and measured by inductively coupled plasma-mass spectrometry (ICP-MS). Serpentinization is a geologic process that produces highly reduced, hydrogen-rich fluids that support microbial communities under high pH conditions. We investigated the activity of microbes capable of extracellular electron transfer in a terrestrial serpentinizing system known as “The Cedars”. Measuring current generation with an on-site two-electrode system, we observed daily oscillations in current with the current maxima and minima occurring during daylight hours. Distinct members of the microbial community were enriched. Current generation in lab-scale electrochemical reactors did not oscillate, but was correlated with carbohydrate amendment in Cedars-specific minimal media. Gammaproteobacteria and Firmicutes were consistently enriched from lab electrochemical systems on δ-MnO2 and amorphous Fe(OH)3 at pH 11. However, isolation of an electrogenic strain proved difficult as transfer cultures failed to grow after multiple rounds of media transfer. Lowering the bulk pH in the media allowed us to isolate a Firmicutes strain (Paenibacillus sp.). This strain was capable of electrode and mineral reduction (including magnetite) at pH 9. This report provides evidence of the in situ activity of microbes using extracellular substrates as sinks for electrons at The Cedars, but also highlights the potential importance of community dynamics for supporting microbial life through either carbon fixation and/or moderating pH stress. The global deep subsurface biosphere is one of the largest reservoirs for microbial life on our planet. This study takes advantage of new sampling technologies and couples them with improvements to DNA sequencing and associated informatics tools to reconstruct the genomes of uncultivated Bacteria and Archaea from fluids collected deep within the Juan de Fuca Ridge subseafloor. Here, we generated two metagenomes from borehole observatories located 311 meters apart and, using binning tools, retrieved 98 genomes from metagenomes (GFMs). Of the GFMs, 31 were estimated to be >90% complete, while an additional 17 were >70% complete. Phylogenomic analysis revealed 53 bacterial and 45 archaeal GFMs, of which nearly all were distantly related to known cultivated isolates. In the GFMs, abundant Bacteria included Chloroflexi, Nitrospirae, Acetothermia (OP1), EM3, Aminicenantes (OP8), Gammaproteobacteria, and Deltaproteobacteria, while abundant Archaea included Archaeoglobi, Bathyarchaeota (MCG), and Marine Benthic Group E (MBG-E). These data are the first GFMs reconstructed from the deep basaltic subseafloor biosphere, and provide a dataset available for further interrogation. The oceans that cover 70% of the Earth's surface lie above 3×108 km3 of sediment containing an estimated 3×1029 microbial cells. The role played by spores in low-energy sedimentary ecosystems remains an enigma. Despite conflicting results from earlier analyses, archaea and bacteria apparently exist in similar abundances within deep-sea sediments. Within these sediments, anaerobic metabolisms dominate, especially those in which sulfate reduction and oxidation of organic matter are coupled. Modeling proves crucial when trying to connect sedimentary microorganisms to their appropriate geochemical environments. Marine sediments contribute significantly to global element cycles on multiple time scales. This is due in large part to microbial activity in the shallower layers and abiotic reactions resulting from increasing temperatures and pressures at greater depths. Quantifying the rates of these diagenetic changes requires a three-dimensional description of the physiochemical properties of marine sediments. In a step toward reaching this goal, we have combined global data sets describing bathymetry, heat conduction, bottom-water temperatures, and sediment thickness to quantify the three-dimensional distribution of temperature in marine sediments. This model has revealed that ∼35% of sediments are above 60 °C, conditions that are suitable for petroleum generation. Furthermore, significant microbial activity could be inhibited in ∼25% of marine sediments, if 80 °C is taken as a major thermal barrier for subsurface life. In addition to a temperature model, we have calculated new values for the total volume (3.01 × 108 km3) and average thickness (721 m) of marine sediments, and provide the only known determination of the volume of marine-sediment pore water (8.46 × 107 km3), equivalent to ∼6.3% of the volume of the ocean. The results presented here can be used to help quantify the rates of mineral transformations, lithification, catagenesis, and the extent of life in the subsurface on a global scale. One of the most important classic and contemporary interests in biology is the connection between cellular composition and physiological function. Decades of research have allowed us to understand the detailed relationship between various cellular components and processes for individual species, and have uncovered common functionality across diverse species. However, there still remains the need for frameworks that can mechanistically predict the tradeoffs between cellular functions and elucidate and interpret average trends across species. Here we provide a comprehensive analysis of how cellular composition changes across the diversity of bacteria as connected with physiological function and metabolism, spanning five orders of magnitude in body size. We present an analysis of the trends with cell volume that covers shifts in genomic, protein, cellular envelope, RNA and ribosomal content. We show that trends in protein content are more complex than a simple proportionality with the overall genome size, and that the number of ribosomes is simply explained by cross-species shifts in biosynthesis requirements. Furthermore, we show that the largest and smallest bacteria are limited by physical space requirements. At the lower end of size, cell volume is dominated by DNA and protein content—the requirement for which predicts a lower limit on cell size that is in good agreement with the smallest observed bacteria. At the upper end of bacterial size, we have identified a point at which the number of ribosomes required for biosynthesis exceeds available cell volume. Between these limits we are able to discuss systematic and dramatic shifts in cellular composition. Much of our analysis is connected with the basic energetics of cells where we show that the scaling of metabolic rate is surprisingly superlinear with all cellular components. Enrichment cultures inoculated with hydrothermally influenced nearshore sediment from Papua New Guinea led to the isolation of an arsenic-tolerant, acidophilic, facultatively aerobic bacterial strain designated PNG-AprilT. Cells of this strain were Gram-stain-negative, rod-shaped, motile and did not form spores. Strain PNG-AprilT grew at temperatures between 4 °C and 40 °C (optimum 30–37 °C), at pH 3.5 to 8.3 (optimum pH 5–6) and in the presence of up to 2.7 % NaCl (optimum 0–1.0 %). Both arsenate and arsenite were tolerated up to concentrations of at least 0.5 mM. Metabolism in strain PNG-AprilT was strictly respiratory. Heterotrophic growth occurred with O2 or nitrate as electron acceptors, and aerobic lithoautotrophic growth was observed with thiosulfate or nitrite as electron donors. The novel isolate was capable of N2-fixation. The respiratory quinones were Q-8 and Q-7. Phylogenetically, strain PNG-AprilT belongs to the genus Burkholderia and shares the highest 16S rRNA gene sequence similarity with the type strains of Burkholderia fungorum (99.8 %), Burkholderia phytofirmans (98.8 %), Burkholderia caledonica(98.4 %) and Burkholderia sediminicola (98.4 %). Differences from these related species in several physiological characteristics (lipid composition, carbohydrate utilization, enzyme profiles) and DNA–DNA hybridization suggested the isolate represents a novel species of the genus Burkholderia , for which we propose the name Burkholderia insulsa sp. nov. The type strain is PNG-AprilT ( = DSM 28142T = LMG 28183T). Amorphous orpiment-like As-sulfides (As2S3) are the most common As phases precipitating in hydrothermal systems, yet there is a lack of information regarding their solid-state characterization. Using a combination of optical, SEM–EDS, micro-Raman and XANES/EXAFS applications, we investigated yellow-orange As- and S-rich sediments occurring in the shallow-water hydrothermal system off the coast of Milos Island, Greece. The precipitates have several morphologies, but are dominantly colloidal. Intriguing “biological” morphologies also exist (e.g., cell-like (~ 10 μm), spirals (~ 20 μm), and rounded “cinnamon bun” shapes (~ 20 μm)). SEM–EDS data indicated that the precipitates have an As:S ratio similar to orpiment (average = 0.58, range 0.51–0.63; n = 8). Micro-Raman spectra indicated that orange colored precipitates appear to be dominated by poorly crystalline and/or amorphous arsenic sulfides with micro-amounts of more crystalline orpiment and impure sulfur. The yellow sediments also contained crystalline elemental sulfur in the form S8. Bulk As K-edge XANES spectra of the As-sulfide precipitates proved a valence of As corresponding to orpiment-type (As2S3) compounds (− 1 to + 3). EXAFS fitting results indicated that the studied material exhibits an amorphous orpiment-like structure with As ions coordinated by 3 sulfur atoms (CN = 3.0). The As–S interatomic distance of the first shell is calculated at 2.279 Å and the Debye–Waller factor (σ2) is 0.00427. These data suggest that the modeled structure of the studied precipitates is slightly S-deficient and ordered only in the first shell around As, resembling an orpiment-type structure, whereas higher shells are not present and must be disordered. The disorder phenomenon may be strictly produced either by the existence of occasional As–S–As bridges with As–As bonds or by the occurrence of As–O–As bridges, causing twisting of the AsS3 pyramids in the initial orpiment structure. This distortion in the higher coordination shells of the structural sheets creates the amorphous orpiment. Although fluids within the upper oceanic basaltic crust harbor a substantial fraction of the total prokaryotic cells on Earth, the energy needs of this microbial population are unknown. In this study, a nanocalorimeter (sensitivity down to 1.2 nW ml-1) was used to measure the enthalpy of microbially catalyzed reactions as a function of temperature in samples from two distinct crustal fluid aquifers. Microorganisms in unamended, warm (63°C) and geochemically altered anoxic fluids taken from 292 meters sub-basement (msb) near the Juan de Fuca Ridge produced 267.3 mJ of heat over the course of 97 h during a step-wise isothermal scan from 35.5 to 85.0°C. Most of this heat signal likely stems from the germination of thermophilic endospores (6.66 × 104 cells ml-1FLUID) and their subsequent metabolic activity at temperatures greater than 50°C. The average cellular energy consumption (5.68 pW cell-1) reveals the high metabolic potential of a dormant community transported by fluids circulating through the ocean crust. By contrast, samples taken from 293 msb from cooler (3.8°C), relatively unaltered oxic fluids, produced 12.8 mJ of heat over the course of 14 h as temperature ramped from 34.8 to 43.0°C. Corresponding cell-specific energy turnover rates (0.18 pW cell-1) were converted to oxygen uptake rates of 24.5 nmol O2 ml-1FLUID d-1, validating previous model predictions of microbial activity in this environment. Given that the investigated fluids are characteristic of expansive areas of the upper oceanic crust, the measured metabolic heat rates can be used to constrain boundaries of habitability and microbial activity in the oceanic crust. Extreme thermal gradients and compressed metabolic zones limit the depth range of microbial colonization in hydrothermally active sediments at Guaymas Basin. We investigated the physicochemical characteristics of this ecosystem and their influence on microbial community structure. Temperature‐related trends of δ13C values of methane and dissolved inorganic carbon from 36 sediment cores suggest in situ thermal limits for microbial anaerobic methane oxidation and organic carbon re‐mineralization near 80°C and 100°C respectively. Temperature logging probes deposited in hydrothermal sediments for 8 days demonstrate substantial thermal fluctuations of up to 25°C. Putative anaerobic methanotroph (ANME) populations dominate the archaeal community, transitioning from ANME‐1 archaea in warm surficial sediments towards ANME‐1 Guaymas archaea as temperatures increase downcore. Since ANME archaea performing anaerobic oxidation of methane double on longer time scales (months) compared with relatively rapid in situ temperature fluctuations (hours to days), we conclude that ANME archaea possess a high tolerance for short‐term shifts in the thermal regime. The environmental conditions that describe an ecosystem define the amount of energy available to the resident organisms and the amount of energy required to build biomass. Here, we quantify the amount of energy required to make biomass as a function of temperature, pressure, redox state, the sources of C, N and S, cell mass and the time that an organism requires to double or replace its biomass. Specifically, these energetics are calculated from 0 to 125°C, 0.1 to 500 MPa and −0.38 to +0.86 V using CO2, acetate or CH4 for C, NO3− or NH4+ for N and SO42− or HS− for S. The amounts of energy associated with synthesizing the biomolecules that make up a cell, which varies over 39 kJ (g cell)−1, are then used to compute energy-based yield coefficients for a vast range of environmental conditions. Taken together, environmental variables and the range of cell sizes leads to a ~4 orders of magnitude difference between the number of microbial cells that can be made from a Joule of Gibbs energy under the most (5.06 × 1011 cells J−1) and least (5.21 × 107 cells J−1) ideal conditions. When doubling/replacement time is taken into account, the range of anabolism energies can expand even further. To better understand the origin, evolution, and extent of life, we seek to determine the minimum flux of energy needed for organisms to remain viable. Despite the difficulties associated with direct measurement of the power limits for life, it is possible to use existing data and models to constrain the minimum flux of energy required to sustain microorganisms. Here, a we apply a bioenergetic model to a well characterized marine sedimentary environment in order to quantify the amount of power organisms use in an ultralow-energy setting. In particular, we show a direct link between power consumption in this environment and the amount of biomass (cells cm-3) found in it. The power supply resulting from the aerobic degradation of particular organic carbon (POC) at IODP Site U1370 in the South Pacific Gyre is between ∼10-12 and 10-16 W cm-3. The rates of POC degradation are calculated using a continuum model while Gibbs energies have been computed using geochemical data describing the sediment as a function of depth. Although laboratory-determined values of maintenance power do a poor job of representing the amount of biomass in U1370 sediments, the number of cells per cm-3 can be well-captured using a maintenance power, 190 zW cell-1, two orders of magnitude lower than the lowest value reported in the literature. In addition, we have combined cell counts and calculated power supplies to determine that, on average, the microorganisms at Site U1370 require 50–3500 zW cell-1, with most values under ∼300 zW cell-1. Furthermore, we carried out an analysis of the absolute minimum power requirement for a single cell to remain viable to be on the order of 1 zW cell-1. The subsurface evolution of shallow-sea hydrothermal fluids is a function of many factors including fluid–mineral equilibria, phase separation, magmatic inputs, and mineral precipitation, all of which influence discharging fluid chemistry and consequently associated seafloor microbial communities. Shallow-sea vent systems, however, are understudied in this regard. In order to investigate subsurface processes in a shallow-sea hydrothermal vent, and determine how these physical and chemical parameters influence the metabolic potential of the microbial communities, three shallow-sea hydrothermal vents associated with Panarea Island (Italy) were characterized. Vent fluids, pore fluids and gases at the three sites were sampled and analyzed for major and minor elements, redox-sensitive compounds, free gas compositions, and strontium isotopes. The corresponding data were used to 1) describe the subsurface geochemical evolution of the fluids and 2) to evaluate the catabolic potential of 61 inorganic redox reactions for in situ microbial communities. Generally, the vent fluids can be hot (up to 135 °C), acidic (pH 1.9–5.7), and sulfidic (up to 2.5 mM H2S). Three distinct types of hydrothermal fluids were identified, each with higher temperatures and lower pH, Mg and SO4, relative to seawater. Type 1 was consistently more saline than Type 2, and both were more saline than seawater. Type 3 fluids were similar to or slightly depleted in most major ions relative to seawater. End-member calculations of conservative elements indicate that Type 1 and Type 2 fluids are derived from two different sources, most likely 1) a deeper, higher salinity reservoir and 2) a shallower, lower salinity reservoir, respectively, in a layered hydrothermal system. The deeper reservoir records some of the highest end-member Cl concentrations to date, and developed as a result of recirculation of brine fluids with long term loss of steam and volatiles due to past phase separation. No strong evidence for ongoing phase separation is observed. Type 3 fluids are suggested to be mostly influenced by degassing of volatiles and subsequently dissolution of CO2, H2S, and other gases into the aqueous phase. Gibbs energies (ΔGr) of redox reactions that couple potential terminal electron acceptors (O2, NO3−, MnIV, FeIII, SO42 −, S0, CO2) with potential electron donors (H2, NH4+, Fe2 +, Mn2 +, H2S, CH4) were evaluated at in situ temperatures and compositions for each site and by fluid type. When Gibbs energies of reaction are normalized per kilogram of hydrothermal fluid, sulfur oxidation reactions are the most exergonic, while the oxidation of Fe2 +, NH4+, CH4, and Mn2 + is moderately energy yielding. The energetic calculations indicate that the most robust microbial communities in the Panarea hot springs combine H2S from deep water–rock–gas interactions with O2 that is entrained via seawater mixing to fuel their activities, regardless of site location or fluid type. The oceanic basaltic basement contains the largest aquifer on Earth and potentially plays an important role in the global carbon cycle as a net sink for dissolved organic carbon (DOC). However, few details of the organic matter cycling in the subsurface are known because great water depths and thick sediments typically hinder direct access to this environment. In an effort to examine the role of water–rock–microorganism interaction on organic matter cycling in the oceanic basaltic crust, basement fluid samples collected from three borehole observatories installed on the eastern flank of the Juan de Fuca Ridge were analyzed for dissolved amino acids. Our data show that dissolved free amino acids (1–13 nM) and dissolved hydrolyzable amino acids (43–89 nM) are present in the basement. The amino acid concentrations in the ridge-flank basement fluids are at the low end of all submarine hydrothermal fluids reported in the literature and are similar to those in deep seawater. Amino acids in recharging deep seawater, in situ amino acid production, and diffusional input from overlying sediments are potential sources of amino acids in the basement fluids. Thermodynamic modeling shows that amino acid synthesis in the basement can be sustained by energy supplied from inorganic substrates via chemolithotrophic metabolisms. Furthermore, an analysis of amino acid concentrations and compositions in basement fluids support the notion that heterotrophic activity is ongoing. Similarly, the enrichment of acidic amino acids and depletion of hydrophobic ones relative to sedimentary particulate organic matter suggests that surface sorption and desorption also alters amino acids in the basaltic basement. In summary, although the oceanic basement aquifer is a net sink for deep seawater DOC, similar amino acid concentrations in basement aquifer and deep seawater suggest that DOC is preferentially removed in the basement over dissolved amino acids. Our data also suggest that organic carbon cycling occurs in the oceanic basaltic basement, where an active subsurface biosphere is likely responsible for amino acid synthesis and degradation. A facultatively anaerobic bacterium, designated strain 1MBB1T, was isolated from basaltic breccia collected from 341 m below the seafloor by seafloor drilling of Rigil Guyot during Integrated Ocean Drilling Program Expedition 330. The cells were straight rods, 0.5 μm wide and 1–3 μm long, that occurred singly and in chains. Strain 1MBB1T stained Gram-positive. Catalase and oxidase were produced. The isolate grew optimally at 30 °C and pH 7.5, and could grow with up to 12 % (w/v) NaCl. The DNA G+C content was 40.5 mol%. The major cellular fatty acids were C16: 1ω11c (26.5 %), anteiso-C15: 0 (19.5 %), C16: 0 (18.7 %) and iso-C15: 0 (10.4 %), and the cell-wall diamino acid was meso-diaminopimelic acid. Endospores of strain 1MBB1T oxidized Mn(II) to Mn(IV), and siderophore production by vegetative cells was positive. Phylogenetic analysis of the 16S rRNA gene indicated that strain 1MBB1T was a member of the family Bacillaceae, with Bacillus foraminis CV53T and Bacillus novalis LMG 21837T being the closest phylogenetic neighbours (96.5 and 96.2 % similarity, respectively). This is the first novel species described from deep subseafloor basaltic crust. On the basis of our polyphasic analysis, we conclude that strain 1MBB1T represents a novel species of the genus Bacillus, for which we propose the name Bacillus rigiliprofundi sp. nov. The type strain is 1MBB1T ( = NCMA B78T = LMG 28275T). Shallow-sea (5 m depth) hydrothermal venting off Milos Island provides an ideal opportunity to target transitions between igneous abiogenic sulfide inputs and biogenic sulfide production during microbial sulfate reduction. Seafloor vent features include large (>1 m2) white patches containing hydrothermal minerals (elemental sulfur and orange/yellow patches of arsenic-sulfides) and cells of sulfur oxidizing and reducing microorganisms. Sulfide-sensitive film deployed in the vent and non-vent sediments captured strong geochemical spatial patterns that varied from advective to diffusive sulfide transport from the subsurface. Despite clear visual evidence for the close association of vent organisms and hydrothermalism, the sulfur and oxygen isotope composition of pore fluids did not permit delineation of a biotic signal separate from an abiotic signal. Hydrogen sulfide (H2S) in the free gas had uniform δ34S values (2.5±0.28‰, n=4) that were nearly identical to pore water H2S (2.7±0.36‰, n=21). In pore water sulfate, there were no paired increases in δ34SSO4 and δ18OSO4 as expected of microbial sulfate reduction. Instead, pore water δ34SSO4 values decreased (from approximately 21° to 17°) as temperature increased (up to 97.4°C) across each hydrothermal feature. We interpret the inverse relationship between temperature and δ34SSO4 as a mixing process between oxic seawater and 34S-depleted hydrothermal inputs that are oxidized during seawater entrainment. An isotope mass balance model suggests secondary sulfate from sulfide oxidation provides at least 15% of the bulk sulfate pool. Coincident with this trend in δ34SSO4, the oxygen isotope composition of sulfate tended to be 18O-enriched in low pH (<5), high temperature (>75°C) pore waters. The shift toward high δ18OSO4 is consistent with equilibrium isotope exchange under acidic and high temperature conditions. The source of H2S contained in hydrothermal fluids could not be determined with the present dataset; however, the end-member δ34S value of H2S discharged to the seafloor is consistent with equilibrium isotope exchange with subsurface anhydrite veins at a temperature of ~300°C. 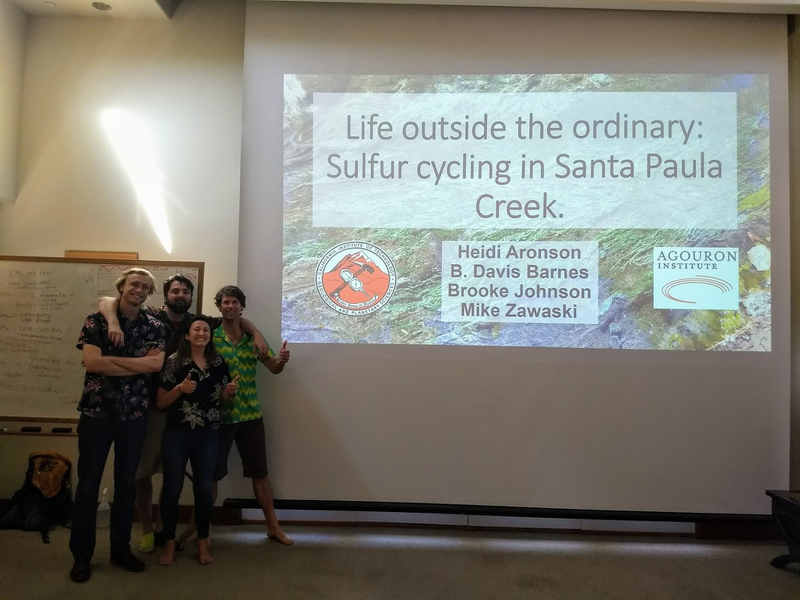 Any biological sulfur cycling within these hydrothermal systems is masked by abiotic chemical reactions driven by mixing between low-sulfate, H2S-rich hydrothermal fluids and oxic, sulfate-rich seawater. The basaltic ocean crust is the largest aquifer system on Earth, yet the rates of biological activity in this environment are unknown. Low-temperature (<100°C) fluid samples were investigated from two borehole observatories in the Juan de Fuca Ridge (JFR) flank, representing a range of upper oceanic basement thermal and geochemical properties. Microbial sulfate reduction rates (SRR) were measured in laboratory incubations with 35S-sulfate over a range of temperatures and the identity of the corresponding sulfate-reducing microorganisms (SRM) was studied by analyzing the sequence diversity of the functional marker dissimilatory (bi)sulfite reductase (dsrAB) gene. We found that microbial sulfate reduction was limited by the decreasing availability of organic electron donors in higher temperature, more altered fluids. Thermodynamic calculations indicate energetic constraints for metabolism, which together with relatively higher cell-specific SRR reveal increased maintenance requirements, consistent with novel species-level dsrAB phylotypes of thermophilic SRM. Our estimates suggest that microbially-mediated sulfate reduction may account for the removal of organic matter in fluids within the upper oceanic crust and underscore the potential quantitative impact of microbial processes in deep subsurface marine crustal fluids on marine and global biogeochemical carbon cycling. The deep subsurface is an enormous repository of microbial life. However, the metabolic capabilities of these microorganisms and the degree to which they are dependent on surface processes are largely unknown. Due to the logistical difficulty of sampling and inherent heterogeneity, the microbial populations of the terrestrial subsurface are poorly characterized. In an effort to better understand the biogeochemistry of deep terrestrial habitats, we evaluate the energetic yield of chemolithotrophic metabolisms and microbial diversity in the Sanford Underground Research Facility (SURF) in the former Homestake Gold Mine, SD, USA. Geochemical data, energetic modeling, and DNA sequencing were combined with principle component analysis to describe this deep (down to 8100 ft below surface), terrestrial environment. SURF provides access into an iron-rich Paleoproterozoic metasedimentary deposit that contains deeply circulating groundwater. Geochemical analyses of subsurface fluids reveal enormous geochemical diversity ranging widely in salinity, oxidation state (ORP 330 to −328 mV), and concentrations of redox sensitive species (e.g., Fe2+ from near 0 to 6.2 mg/L and Σ S2- from 7 to 2778μg/L). As a direct result of this compositional buffet, Gibbs energy calculations reveal an abundance of energy for microorganisms from the oxidation of sulfur, iron, nitrogen, methane, and manganese. Pyrotag DNA sequencing reveals diverse communities of chemolithoautotrophs, thermophiles, aerobic and anaerobic heterotrophs, and numerous uncultivated clades. Extrapolated across the mine footprint, these data suggest a complex spatial mosaic of subsurface primary productivity that is in good agreement with predicted energy yields. Notably, we report Gibbs energy normalized both per mole of reaction and per kg fluid (energy density) and find the later to be more consistent with observed physiologies and environmental conditions. Further application of this approach will significantly expand our understanding of the deep terrestrial biosphere. Directly assessing the impact of subsurface microbial activity on global element cycles is complicated by the inaccessibility of most deep biospheres and the difficulty of growing representative cultivars in the laboratory. In order to constrain the rates of biogeochemical processes in such settings, a quantitative relationship between rates of microbial catalysis, energy supply and demand and population size has been developed that complements the limited biogeochemical data describing subsurface environments. Within this formulation, rates of biomass change are determined as a function of the proportion of catabolic power that is converted into anabolism—either new microorganisms or the replacement of existing cell components—and the amount of energy that is required to synthesize biomass. Catabolic power is related to biomass through an energy-based yield coefficient that takes into account the constraints that different environments impose on biomolecule synthesis; this method is compared to other approaches for determining yield coefficients. Furthermore, so-called microbial maintenance energies that have been reported in the literature, which span many orders of magnitude, are reviewed. The equations developed in this study are used to demonstrate the interrelatedness of catabolic reaction rates, Gibbs energy of reaction, maintenance energy, biomass yield coefficients, microbial population sizes and doubling/replacement times. The number of microorganisms that can be supported by particular combinations of energy supply and demand is illustrated as a function of the catabolic rates in marine environments. Replacement/doubling times for various population sizes are shown as well. Finally, cell count and geochemical data describing two marine sedimentary environments in the South Pacific Gyre and the Peru Margin are used to constrain in situ metabolic and catabolic rates. The formulations developed in this study can be used to better define the limits and extent of life because they are valid for any metabolism under any set of conditions. The origin, evolution, and distribution of life throughout the universe can be better understood by determining the limits to life on Earth. A broad range of many of the physical and chemical constraints that determine the limits to life, such as temperature, pressure, physical space, water content, and the availability of energy and nutrients, are found in subseafloor environments. In fact, several expeditions (Ocean Drilling Program (ODP) and Integrated Ocean Drilling Program (IODP: now International Ocean Discovery Program)) have been at least partially motivated by the desire to explore the boundaries between the habitable and the uninhabitable parts of the subseafloor. In this chapter, the possible subseafloor environments and their physical and chemical characteristics that could signify the limits of the biosphere, particularly the hydrothermally active subseafloor environments, are reviewed. Although the nature and distribution of extreme or fringe biospheres are unknown, previous ODP- and IODP-expedition-based microbiological investigations have shown that the subseafloor hydrothermal systems with relatively abundant energy supplies (sediment-derived organic compounds and serpentinization-derived H2) provide targets for seeking the limits (boundary conditions) in subseafloor environments. Here, we also discuss predicted patterns of the abundance and composition of potential microbial catabolisms in the fringe microbial communities of subseafloor hydrothermal fluids based on the thermodynamic potential of particular catabolic strategies and the computed cost of anabolism in these settings. Quantification of global biogeochemical cycles requires knowledge of the rates at which microorganisms catalyze chemical reactions. In order for models that describe these processes to capture global patterns of change, the underlying formulations in them must account for biogeochemical transformations over seasonal and millennial time scales in environments characterized by different energy levels. Building on existing models, a new thermodynamic limiting function is introduced. With only one adjustable parameter, this function that can be used to model microbial metabolism throughout the range of conditions in which organisms are known to be active. The formulation is based on a comparison of the amount of energy available from any redox reaction to the energy required to maintain a membrane potential, a proxy for the minimum amount of energy required by an active microorganism. This function does not require species- or metabolism-specific parameters, and can be used to model metabolisms that capture any amount of energy. The utility of this new thermodynamic rate limiting term is illustrated by applying it to three low-energy processes: fermentation, methanogenesis and sulfate reduction. The model predicts that the rate of fermentation will be reduced by half once the Gibbs energy of the catalyzed reaction reaches −12 kJ (mol e−)−1, and then slowing exponentially until the energy yield approaches zero. Similarly, the new model predicts that the low energy yield of methanogenesis, −4 to −0.5 kJ (mol e−)−1, for a partial pressure of H2 between 11 and 0.6 Pa decreases the reaction rate by 95–99%. Finally, the new function’s utility is illustrated through its ability to accurately model sulfate concentration data in an anoxic marine sediment. 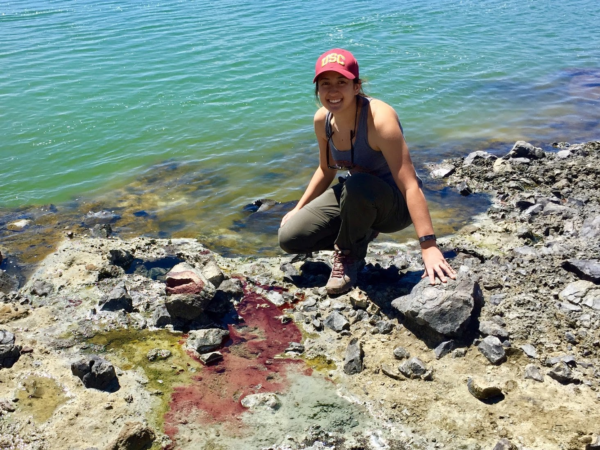 This study is the first to investigate the microbial ecology of the Tutum Bay (Papua New Guinea) shallow-sea hydrothermal system. The subsurface environment was sampled by SCUBA using push cores, which allowed collection of sediments and pore fluids. Geochemical analysis of sediments and fluids along a transect emanating from a discrete venting environment, about 10 mbsl, revealed a complex fluid flow regime and mixing of hydrothermal fluid with seawater within the sediments, providing a continuously fluctuating redox gradient. Vent fluids are highly elevated in arsenic, up to ∼1 ppm, serving as a “point source” of arsenic to this marine environment. 16S rRNA gene and FISH (fluorescence in situ hybridization) analyses revealed distinct prokaryotic communities in different sediment horizons, numerically dominated by Bacteria. 16S rRNA gene diversity at the genus level is greater among the Bacteria than the Archaea. The majority of taxa were similar to uncultured Crenarchaea, Chloroflexus, and various heterotrophic Bacteria. The archaeal community did not appear to increase significantly in number or diversity with depth in these sediments. Further, the majority of sequences identifying with thermophilic bacteria were found in the shallower section of the sediment core. No 16S rRNA genes of marine Crenarchaeota or Euryarchaeota were identified, and none of the identified Crenarchaeota have been cultured. Both sediment horizons also hosted “Korarchaeota”, which represent 2–5% of the 16S rRNA gene clone libraries. Metabolic functions, especially among the Archaea, were difficult to constrain given the distant relationships of most of the community members from cultured representatives. Identification of phenotypes and key ecological processes will depend on future culturing, identification of arsenic cycling genes, and RNA-based analyses. The shallow submarine hydrothermal systems of Tutum Bay, Papua New Guinea, are an ideal opportunity to study the influence of arsenic on a marine ecosystem. Previous reports have demonstrated that the hydrothermal vents in Tutum Bay release arsenic in reduced hydrothermal fluids into the marine environment at the rate of 1.5 kg of arsenic/day. Aqueous arsenite is oxidized and adsorbed onto hydrous ferric oxides [HFOs] surrounding the venting area. We demonstrate here that microorganisms are key in both the oxidation of FeII and AsIII in the areas immediately surrounding the vent source. Surveys of community diversity in biofilms and in vent fluid indicate the presence of zeta-Proteobacteria, alpha-Proteobacteria, Persephonella, and close relatives of the archaeon Nitrosocaldus. The iron oxidizing zeta-Proteobacteria are among the first colonizers of solid substrates near the vents, where they appear to be involved in the precipitation of the hydrous ferric oxides (HFOs). Further, the biofilm communities possess the genetic capacity for the oxidation of arsenite. The resulting arsenate is adsorbed onto the HFOs, potentially removing the arsenic from the immediate marine system. No evidence was found for dissimilatory arsenate reduction, but the arsenate may be remobilized by detoxification mechanisms. This is the first demonstration of the genetic capacity for arsenic cycling in high temperature, shallow-sea vent communities, supporting recent culture-based findings in similar systems in Greece (Handley et al., 2010). These reports extend the deep-sea habitat of the zeta-Proteobacteria to shallow submarine hydrothermal systems, and together implicate biological oxidation of both iron and arsenite as primary biogeochemical processes in these systems, providing a mechanism for the partial removal of aqueous arsenic from the marine environment surrounding the vents. Phase separation is a ubiquitous process in seafloor hydrothermal vents, creating a large range of salinities. Toxic elements (e.g., arsenic) partition into the vapor phase, and thus can be enriched in both high and low salinity fluids. However, investigations of microbial diversity at sites associated with phase separation are rare. We evaluated prokaryotic diversity in arsenic-rich shallow-sea vents off Milos Island (Greece) by comparative analysis of 16S rRNA clone sequences from two vent sites with similar pH and temperature but marked differences in salinity. Clone sequences were also obtained for aioA-like functional genes (AFGs). Bacteria in the surface sediments (0–1.5 cm) at the high salinity site consisted of mainly Epsilonproteobacteria (Arcobacter sp. ), which transitioned to almost exclusively Firmicutes (Bacillus sp.) at ~10 cm depth. However, the low salinity site consisted of Bacteroidetes (Flavobacteria) in the surface and Epsilonproteobacteria (Arcobacter sp.) at ~10 cm depth. Archaea in the high salinity surface sediments were dominated by the orders Archaeoglobales and Thermococcales, transitioning to Thermoproteales and Desulfurococcales (Staphylothermus sp.) in the deeper sediments. In contrast, the low salinity site was dominated by Thermoplasmatales in the surface and Thermoproteales at depth. Similarities in gas and redox chemistry suggest that salinity and/or arsenic concentrations may select for microbial communities that can tolerate these parameters. Many of the archaeal 16S rRNA sequences contained inserts, possibly introns, including members of the Euryarchaeota. Clones containing AFGs affiliated with either Alpha- or Betaproteobacteria, although most were only distantly related to published representatives. Most clones (89%) originated from the deeper layer of the low salinity, highest arsenic site. This is the only sample with overlap in 16S rRNA data, suggesting arsenotrophy as an important metabolism in similar environments. Active deep-sea hydrothermal vents are hosted by a range of different rock types, including basalt, peridotite, and felsic rocks. The associated hydrothermal fluids exhibit substantial chemical variability, which is largely attributable to compositional differences among the underlying host rocks. Numerical models were used to evaluate the energetics of seven inorganic redox reactions (potential catabolisms of chemolithoautotrophs) and numerous biomolecule synthesis reactions (anabolism) in a representative sampling of these systems, where chemical gradients are established by mixing hydrothermal fluid with seawater. The wide ranging fluid compositions dictate demonstrable differences in Gibbs energies (ΔGr) of these catabolic and anabolic reactions in three peridotite-hosted, six basalt-hosted, one troctolite-basalt hybrid, and two felsic rock-hosted systems. In peridotite-hosted systems at low to moderate temperatures (<∼45 °C) and high seawater:hydrothermal fluid (SW:HF) mixing ratios (>10), hydrogen oxidation yields the most catabolic energy, but the oxidation of methane, ferrous iron, and sulfide can also be moderately exergonic. At higher temperatures, and consequent SW:HF mixing ratios <10, anaerobic processes dominate the energy landscape; sulfate reduction and methanogenesis are more exergonic than any of the aerobic respiration reactions. By comparison, in the basalt-hosted and felsic rock-hosted systems, sulfide oxidation was the predominant catabolic energy source at all temperatures (and SW:HF ratios) considered. The energetics of catabolism at the troctolite-basalt hybrid system were intermediate to these extremes. Reaction energetics for anabolism in chemolithoautotrophs—represented here by the synthesis of amino acids, nucleotides, fatty acids, saccharides, and amines—were generally most favorable at moderate temperatures (22–32 °C) and corresponding SW:HF mixing ratios (∼15). In peridotite-hosted and the troctolite-basalt hybrid systems, ΔGr for primary biomass synthesis yielded up to ∼900 J per g dry cell mass. The energetics of anabolism in basalt- and felsic rock-hosted systems were far less favorable. The results suggest that in peridotite-hosted (and troctolite-basalt hybrid) systems, compared with their basalt (and felsic rock) counterparts, microbial catabolic strategies—and consequently variations in microbial phylotypes—may be far more diverse and some biomass synthesis may yield energy rather than imposing a high energetic cost. During the past decade, the IODP (International Ocean Discovery Program) has fostered a significant increase in deep biosphere investigations in the marine sedimentary and crustal environments, and scientists are well-poised to continue this momentum into the next phase of the IODP. The goals of this workshop were to evaluate recent findings in a global context, synthesize available biogeochemical data to foster thermodynamic and metabolic activity modeling and measurements, identify regional targets for future targeted sampling and dedicated expeditions, foster collaborations, and highlight the accomplishments of deep biosphere research within IODP. Twenty-four scientists from around the world participated in this one-day workshop sponsored by IODP-MI and held in Florence, Italy, immediately prior to the Goldschmidt 2013 conference. A major topic of discussion at the workshop was the continued need for standard biological sampling and measurements across IODP platforms. Workshop participants renew the call to IODP operators to implement recommended protocols. Thermodynamic modelling of organic synthesis has largely been focused on deep-sea hydrothermal systems. When seawater mixes with hydrothermal fluids, redox gradients are established that serve as potential energy sources for the formation of organic compounds and biomolecules from inorganic starting materials. This energetic drive, which varies substantially depending on the type of host rock, is present and available both for abiotic (outside the cell) and biotic (inside the cell) processes. Here, we review and interpret a library of theoretical studies that target organic synthesis energetics. The biogeochemical scenarios evaluated include those in present-day hydrothermal systems and in putative early Earth environments. It is consistently and repeatedly shown in these studies that the formation of relatively simple organic compounds and biomolecules can be energy-yielding (exergonic) at conditions that occur in hydrothermal systems. Expanding on our ability to calculate biomass synthesis energetics, we also present here a new approach for estimating the energetics of polymerization reactions, specifically those associated with polypeptide formation from the requisite amino acids. The fluids emanating from active submarine hydrothermal vent chimneys provide a window into subseafloor processes and, through mixing with seawater, are responsible for steep thermal and compositional gradients that provide the energetic basis for diverse biological communities. Although several models have been developed to better understand the dynamic interplay of seawater, hydrothermal fluid, minerals and microorganisms inside chimney walls, none provide a fully integrated approach to quantifying the biogeochemistry of these hydrothermal systems. In an effort to remedy this, a fully coupled biogeochemical reaction-transport model of a hydrothermal vent chimney has been developed that explicitly quantifies the rates of microbial catalysis while taking into account geochemical processes such as fluid flow, solute transport and oxidation–reduction reactions associated with fluid mixing as a function of temperature. The metabolisms included in the reaction network are methanogenesis, aerobic oxidation of hydrogen, sulfide and methane and sulfate reduction by hydrogen and methane. Model results indicate that microbial catalysis is generally fastest in the hottest habitable portion of the vent chimney (77–102 °C), and methane and sulfide oxidation peak near the seawater-side of the chimney. The fastest metabolisms are aerobic oxidation of H2 and sulfide and reduction of sulfate by H2 with maximum rates of 140, 900 and 800 pmol cm−3 d−1, respectively. The maximum rate of hydrogenotrophic methanogenesis is just under 0.03 pmol cm−3 d−1, the slowest of the metabolisms considered. Due to thermodynamic inhibition, there is no anaerobic oxidation of methane by sulfate (AOM). These simulations are consistent with vent chimney metabolic activity inferred from phylogenetic data reported in the literature. The model developed here provides a quantitative approach to describing the rates of biogeochemical transformations in hydrothermal systems and can be used to constrain the role of microbial activity in the deep subsurface. This study examines the potential for the biologically mediated anaerobic oxidation of methane (AOM) coupled to sulfate reduction on ancient Mars. Seven distinct fluids representative of putative martian groundwater were used to calculate Gibbs energy values in the presence of dissolved methane under a range of atmospheric CO2 partial pressures. In all scenarios, AOM is exergonic, ranging from −31 to −135 kJ/mol CH4. A reaction transport model was constructed to examine how environmentally relevant parameters such as advection velocity, reactant concentrations, and biomass production rate affect the spatial and temporal dependences of AOM reaction rates. Two geologically supported models for ancient martian AOM are presented: a sulfate-rich groundwater with methane produced from serpentinization by-products, and acid-sulfate fluids with methane from basalt alteration. The simulations presented in this study indicate that AOM could have been a feasible metabolism on ancient Mars, and fossil or isotopic evidence of this metabolic pathway may persist beneath the surface and in surface exposures of eroded ancient terrains. Although it is becoming clear that microorganisms are abundant in marine deep sediments [1–8], it is unclear what percentage of cells are active, how fast they are growing or what controls their diversity and population size . Addressing these issues is a formidable task due to the relative inaccessibility of these environments, the difficulty of cultivating representative microorganisms and the long time scales associated with some of their lifestyles [2, 10–12]. However, quantitative limits on life in the subsurface can be determined by using the physiochemical data that describe their habitats. In particular, the chemical composition can be used to constrain likely metabolic strategies and rates in a given setting. This is accomplished by calculating values of Gibbs energy available from reactions containing different combinations of the electron donors and acceptors that are found in these environments. Not only can Gibbs energies of reaction reveal which catabolic strategies are thermodynamically possible, but they can also help determine which geochemical variables (e.g. temperature, pressure, pH, salinity, composition) are controlling microbial activity. When reduced to an environmentally-appropriate common factor, the energetic potential of all biogeochemical environments can be directly compared to assess how energy limitations affect the amount and type of biomass in them. In the present chapter, geochemical data obtained from sediment cores taken from the Peru Margin, South Pacific Gyre and Juan de Fuca Ridge are used to assess the Gibbs energies of plausible catabolic strategies including, but not limited to, the oxidation of organic matter, methane and hydrogen by a variety of electron acceptors. In conjunction with cell-count data, the results of these calculations illustrate the importance of normalizing energy availability to the limiting substrate and how geochemical data can be used to better understand the distribution of life deep in marine sediments. The permeable rocks of the upper oceanic basement contain seawater-sourced fluids estimated to be ~ 2% of the global ocean volume. This represents a very large potential subsurface biosphere supported by chemosynthesis. Recent collection of high integrity samples of basement fluid from the sedimented young basaltic basement on the Juan de Fuca Ridge flanks, off the coasts of Vancouver Island (Canada) and Washington (USA), and subsequent chemical analyses permit numerical modeling of metabolic redox reaction energetics. Here, values of Gibbs free energy for potential chemolithotrophic net reactions were calculated in basement fluid and in zones where basement fluid and entrained seawater may mix; the energy yields are reported both on a per mole electrons transferred and on a per kg of basement fluid basis. In pure basement fluid, energy yields from the anaerobic respiration processes investigated are anemic, releasing < 0.3 J/kg basement fluid for all reactions except methane oxidation by ferric iron, which releases ~ 0.6 J/kg basement fluid. In mixed solutions, aerobic oxidation of hydrogen, methane, and sulfide is the most exergonic on a per mole electron basis. Per kg of basement fluid, the aerobic oxidation of ammonia is by far the most exergonic at low temperature and high seawater:basement fluid ratio, decreasing by more than two orders of magnitude at the highest temperature (63 °C) and lowest seawater:basement fluid ratio investigated. Compared with mixing zones in deep-sea hydrothermal systems, oceanic basement aquifers appear to be very low energy systems, but because of their expanse, may support what has been labeled the ‘starving majority’. The permeable upper oceanic basement serves as a plausible habitat for a variety of microbial communities. There is growing evidence suggesting a substantial subseafloor biosphere. Here new time series data are presented on key inorganic species, methane, hydrogen and dissolved organic carbon (DOC) in ridge flank fluids obtained from subseafloor observatory CORKs (Circulation Obviation Retrofit Kits) at Integrated Ocean Drilling Program (IODP) boreholes 1301A and 1026B. These data show that the new sampling methods (Cowen et al., 2012) employed at 1301A result in lower contamination than earlier studies. Furthermore, sample collection methods permitted most chemical analyses to be performed from aliquots of single large volume samples, thereby allowing more direct comparison of the data. The low phosphate concentrations (0.06–0.2 μM) suggest that relative to carbon and nitrogen, phosphorus could be a limiting nutrient in the basement biosphere. Coexisting sulfate (17–18 mM), hydrogen sulfide (∼0.1 μM), hydrogen (0.3–0.7 μM) and methane (1.5–2 μM) indicates that the basement aquifer at 1301A either draws fluids from multiple flow paths with different redox histories or is a complex environment that is not thermodynamically controlled and may allow co-occurring metabolic pathways including sulfate reduction and methanogenesis. The low DOC concentrations (11–18 μM) confirm that ridge flank basement is a net DOC sink and ultimately a net carbon sink. Based on the net amounts of DOC, oxygen, nitrate and sulfate removed (∼30 μM, ∼80 μM, ∼40 μM and ∼10 mM, respectively) from entrained bottom seawater, organic carbon may be aerobically or anaerobically oxidized in biotic and/or abiotic processes.